The BRITISH EMPIRE & FOREIGN COUNTRIES auction held at Grosvenor over two days on 25th and 26th September realised a total of £721,893, comfortably confirming the auctioneers’ pre-sale expectation. This auction was notable for the coming together of a number of impressive specialised collections, each the product of many years of dedicated gathering and study. With the noted exception of certain Foreign countries, still to return to their previous heights, the sale reflected a global stamp market that is on the rise and optimistic. Featured on the front cover of the sale catalogue, the Cameroon Expeditionary Force 3s. on 3m. with double surcharge (lot 442, est. £6,000-7,000, left), came from a further offering of material from the fascinating collection of Cameroons formed by R.J. Maddocks. Just one sheet of twenty stamps showing this variety once existed and this fine example sold for an impressive £10,234. The offering of countries of former British Africa was greatly enhanced by the exceptional collections of East Africa by Dr. Anthony Frisby and Southern Africa by the late Raymond Glanville-Jones. 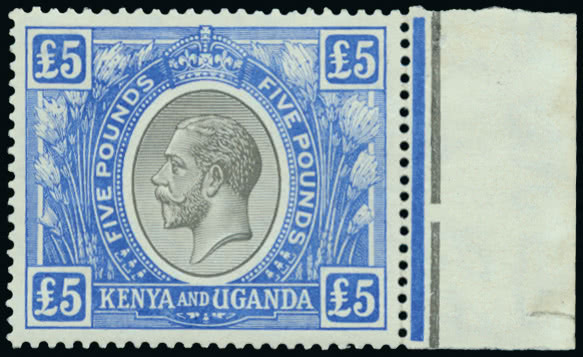 The handsome high values produced during the reign of King George V remain ever popular, the £2,574 paid for an unmounted mint example of the Kenya, Uganda & Tanganyika 1922 £5 (lot 1019, above) reflecting the recent rise of its Stanley Gibbons catalogue value. The Ron Peters collection of Gibraltar and Great Britain issues overprinted for use in the Morocco Agencies excited much interest with many lots greatly surpassing their estimates. Only two full strips of twelve of the 1898 local overprint 10c. 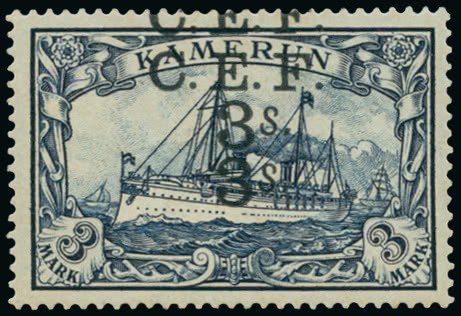 carmine with the six stamps at right showing the overprint double variety (S.G. 2ea) are known. One of these two strips, in spite of some imperfections, found a new home for £1,806 (lot 1267). The exceptional collection of Iran formed by the late Peter Greenway attracted attention from collectors across the world. 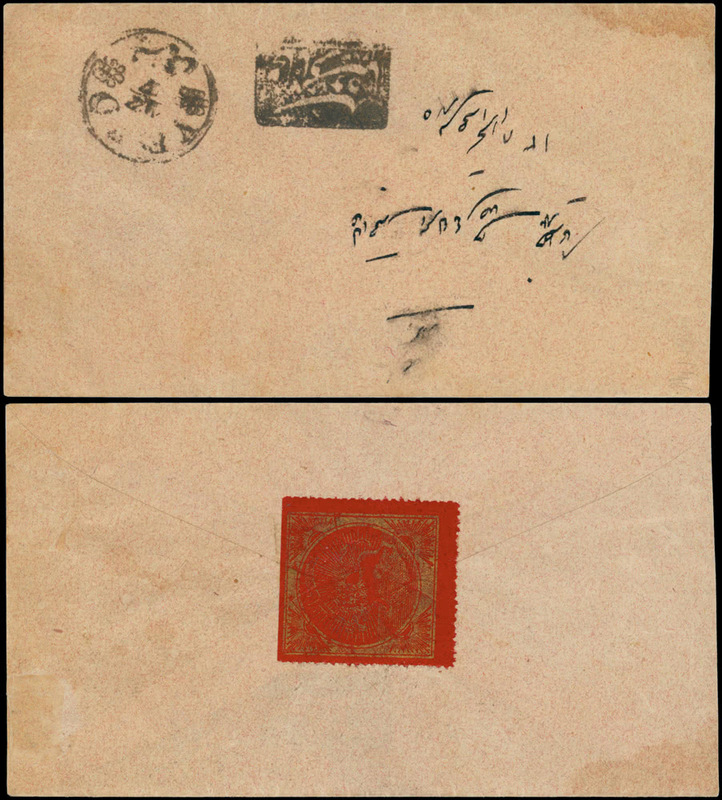 An example of the 1865 Riester essay, attractively printed in gold on red paper and here found affixed to the reverse of an envelope by the Qajar Shah (lot 839, est. £350-400) rose in bidding to £899. The Postal Stationery of Ceylon would not be every collector’s cup of tea but the outstanding collection formed by the late Dr. W.K. Mansfield but was greeted with enthusiasm by his fellow specialists, with a number of notable realisations achieved. Sold on behalf of charity, the collection of Ireland formed by the late Tony Best was similarly well received. 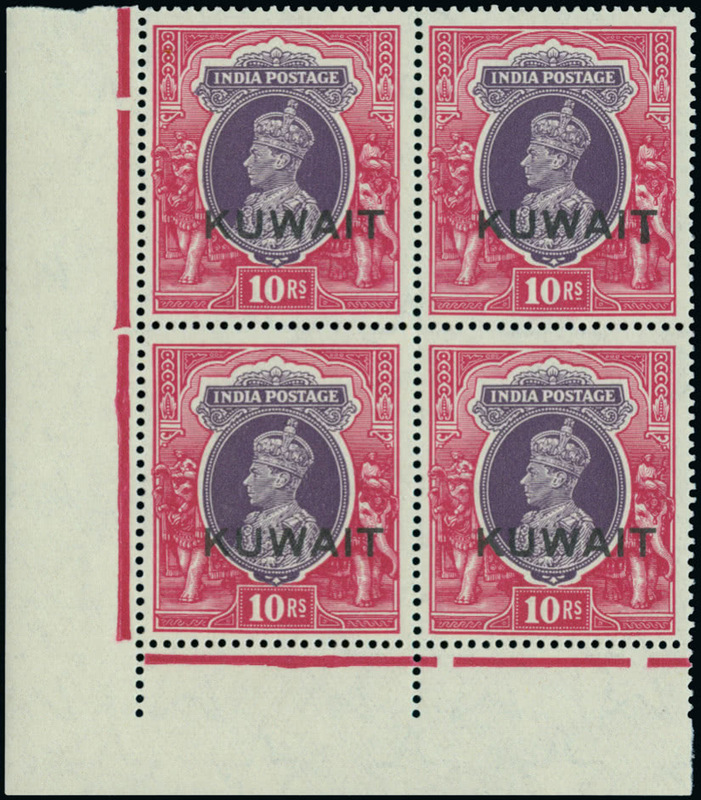 Kuwait, a fine collection formed by Dr. L. Phillips met a slightly patchier response although stronger prices for K.G.VI items included the £1,872 paid for the unmounted block of four of the 1939 10r., one showing extended “T” (lot 1078, left). Among other notable individual realisations, an 1837 entire letter from London to Cacutta written by Sir Gore Ouseley, Privy Councillor to King William IV and Queen Victoria, reporting the accession of the new queen was enthusiastically bid to a figure of £5,6616 (lot 611, est. £1,500-2,000, left). 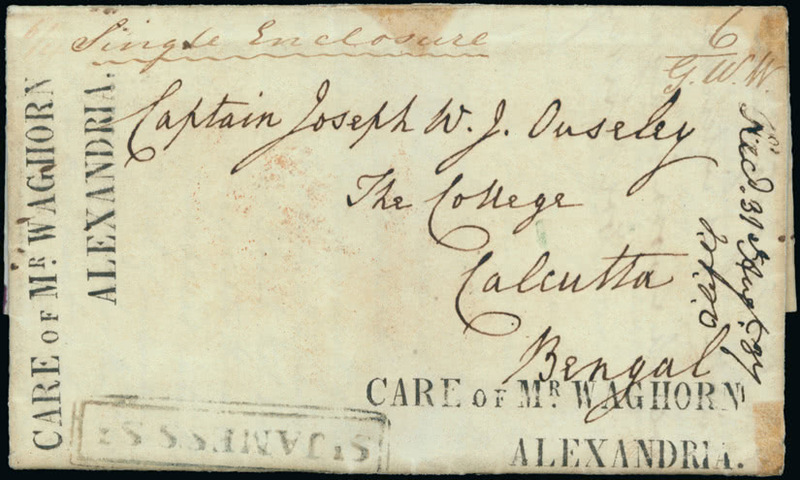 The letter had passed via Egypt and displays two strikes of the rare “CARE OF Mr WAGHORN/ ALEXANDRIA” handstamp. A remarkable item marrying historic and postal significance.